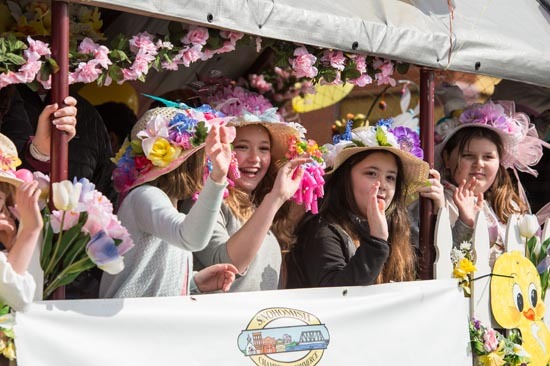 Participants in the annual bonnet contest ride the Chamber of Commerce’s float during the 2018 Easter Parade. This year’s Easter Parade is Saturday, April 20 starting at 11 a.m. on First Street. If you enter the bonnet contest, you can ride in the parade if you catch this float by 10:45 a.m. at the east end of First Street. SNOHOMISH — It’s almost time to hop over to the parade. The Easter Bunny will join more than 60 floats, bands, ROTC drill teams and dance troupes in this special small-town tradition complete with iconic bonnets. The usual favorites, such as the Cathcart Unicycle Club, rolling antique tractor displays and the Seafair Pirates, are expected to be part of the show, too. The parade kicks off at 11 a.m. on Saturday, April 20 on First Street. The Snohomish Easter Parade is steeped in tradition as a corps of about 50 volunteers put it together. Over 38 years, those who saw it as children in the ‘80s have grown into some of the event’s volunteers, while others who love its family-friendly feel have come on board to participate. One could say the heart of the parade is pulsing strong, even if Easter parades have turned into a national rarity. Snohomish’s is the only one held in western Washington state. The two nearest Easter parades are held in Oregon and in Kelowna, British Columbia. The first parade in 1981 had most of the same components: The bonnet contest, the floats, the bands down First Street, plus the Rainier Beer Deers. It was called the Easter Happening. The Chamber of Commerce helped steer that parade, as it still does today. Handling the parade is one of chamber manager Pam Schilaty’s favorite parts of the job, she said. The purpose of the parade is for businesses to give back to the community, Schilaty said. This is her 31st parade with the chamber, and said it never gets old. She‘s watched people who attended the parade as kids grow into adults and bring their own families. The parade brings upwards of 3,000 people to Snohomish by an informal count, Schilaty said. The parade begins at 11 a.m., traditionally led by the Easter bunny. The bonnet contest begins shortly after the parade concludes. Afterward, The Pursuit NW Church hosts a free street fair from 1 to 3 p.m. at Averill Field, 402 Second St. The street fair will include barbecue food, bouncy houses and Blitz the Seahawk. The Snohomish Chamber of Commerce invites kids wearing bonnets to ride on the Chamber Float in the Parade. Board it at Cedar Avenue and First Street no later than 10:45 a.m. Parents can ride with children or can meet the float at First Street and Avenue E.
For more parade information go to snohomishchamber.org or call the Snohomish Chamber office at 425-344-8533.